The AFRecorder 2400 combines a single channel of air-fuel ratio (AFR) measurement with measurements of spark timing, manifold pressure, and engine speed. 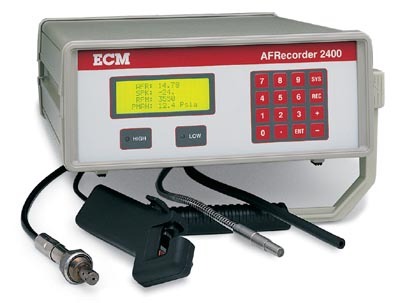 The combination of these four measurements in a single portable package has made the AFRecorder 2400 a popular tool with engine calibrators. Spark timing and engine speed can be measured with the supplied probes or by using signals from production sensors or the engine control module. Manifold pressure is measured using a sensor inside the AFRecorder 2400. Linearized programmable analog outputs, RS-232 control, a programmable SEGO output, recording with build-in statistics, programmable alarms, AC or DC operation, and a carrying case are other AFRecorder 2400 features. SEGO (Simulated Exhaust Gas Oxygen) Sensor Output: Yes. Programmable. Alarms: Yes. High and low trip points.